It’s Monday, which means it is time again to hook up with the dedicated readers of the Book Date Blog and start talking about the kinds of things we’re all currently reading. I read five books last week, a private group I am in is doing a book challenge and so I’ve been reading a lot for that. Luckily, I’m currently on a multi-genre challenge, and it is proving to be a little rough. I need to find a sci-fi book (I think that’ll be satisfied with a Star Trek: Discovery book), a fantasy book, an Espionage book and a historical fiction book-and then I’m thinking the Princess Bridge will cross at least 3 genres–romance, adventure, espionage and fantasy–right? Uh, I was supposed to be reading at least 24 hours this weekend, but after a few scheduled and unscheduled things, I only read for 12 hours–I finished four books, though. So I consider this a win. 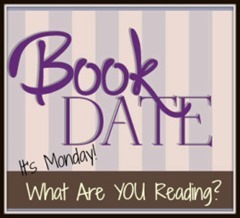 And I’m keeping up on Goodreads, which means that my mini-Bloggiesta this coming weekend is on track. Now, onto my Ravelry knitting challenge–I have left it until the end of the month–so I have to find a simple pattern and figure out how to do it quickly. Let’s hope tonight is an easier night for me.